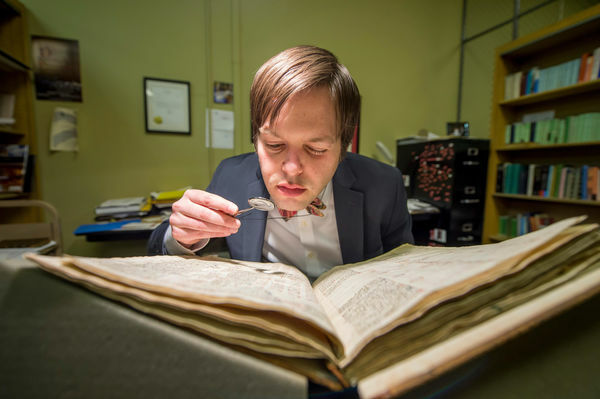 When asked what kept him motivated to continue such a significant but daunting task over the course of over six years, he simply relied: “I just love manuscripts, I really do. It was an amazingly trying and difficult experience but also extremely rewarding because it really pushes you. I liked the challenge. It’s fun for me.” As was Prof. Corbett’s 1978 catalogue, Gura’s new catalogue is published by the University of Notre Dame Press; copies can be purchased online. This outstanding new catalogue was officially launched this past Tuesday evening, February 28th, to a standing-room-only audience. Diane Parr Walker, Edward H. Arnold University Librarian; Rev. William M. Lies, C.S.C., Vice President for Mission Engagement and Church Affairs; and Prof. Tom Burman, Robert M. Conway Director of the Medieval Institute, all gave opening remarks. They universally praised the careful thoroughness of Gura’s catalogue. 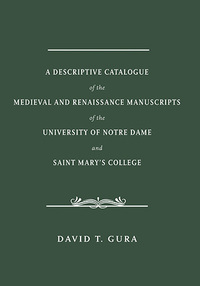 Gura spoke on the history of Special Collections at Notre Dame and the genesis and development of his catalogue, showing a number of fascinating examples of manuscripts in the collection. Everyone looks forward to the future publications resulting from this project and the supplement to his volume Gura already has in the works. Originally published by Brandon Cook at medieval.nd.edu on March 08, 2017.